Syed Husin Abdullah, 60, says he can barely sell two items a day. KUALA LUMPUR: Street vendors in the Jalan Melayu bazaar fear for their future if they are moved towards the Coliseum Cafe and Hotel, a site which they say lacks the pedestrian traffic needed to sustain their businesses. 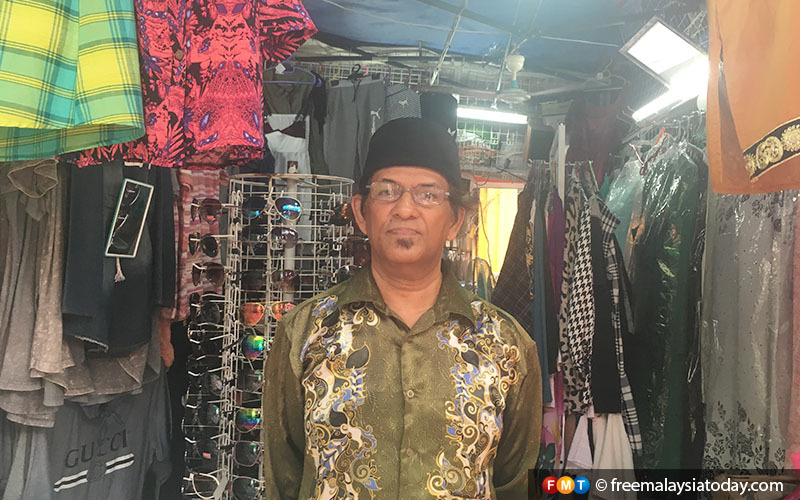 Syed Husin Abdullah, 60, is one of the vendors in the Jalan Melayu area which is slated to make way for the city’s River of Life project to rehabilitate the main river banks. He has been selling knick knacks at his stall for 18 years, but business started to suffer five years ago. They might make even less if moved to a new building near the Coliseum in Jalan Tuanku Abdul Rahman. 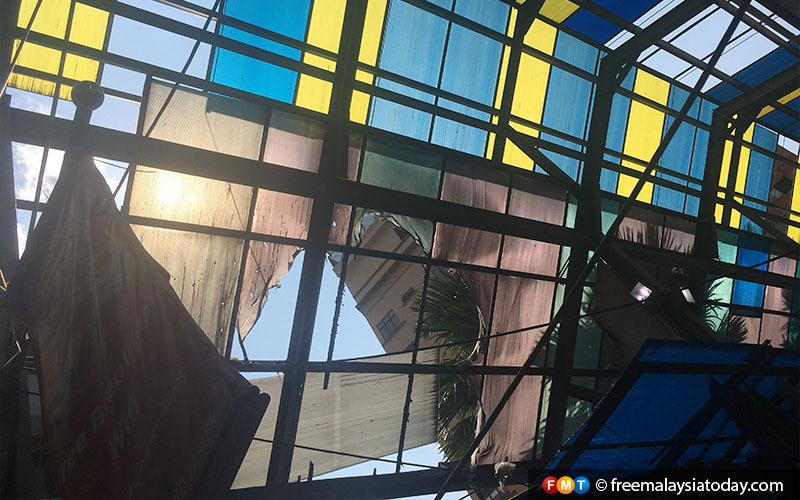 Holes in the roof of the walkway from the Masjid Jamek LRT entrance to Jalan Esfahan near Sogo. He said the street vendors had often raised their problems, but their requests do not always get approved. He showed holes in the roof, which has been in need of repairs since a fire a few years ago. “If it rains, everything gets wet, and I have to close shop,” he said. It was also a safety hazard for passers-by. Abdul Kadir Abdul Hamid, 68, has run a stall selling padlocks, towels and accessories for about 20 years. He and his wife depend on the earnings to take care of their two school-going children. “Whatever it is, we have to do business every day. But now, we can only get RM30 or RM20, sometimes RM10, and on other days we cannot even make any amount of money. It’s not like how it was last time,” he said. He said the Jalan Melayu vendors may suffer the same fate as those who were moved to Keramat Mall in 2009. “They open a mall that’s so nice and grand, but there’s no demand, people don’t come. 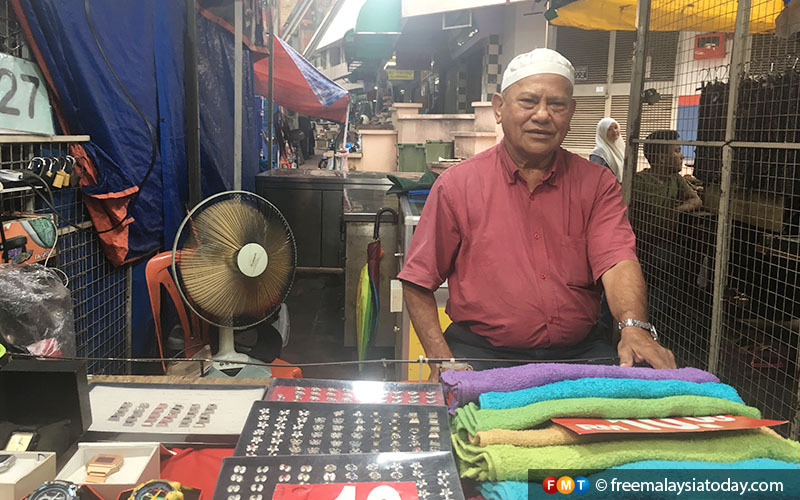 Abdul Kadir Abdul Hamid, 68, has been running his stall selling padlocks, towels and accessories for about 20 years. Nasahrudin Abass, who sells brooches and jewellery, has doubts that vendors could survive for more than six months if they are moved into a building. In most cases where DBKL had moved street vendors into designated buildings, almost all had run out of business. 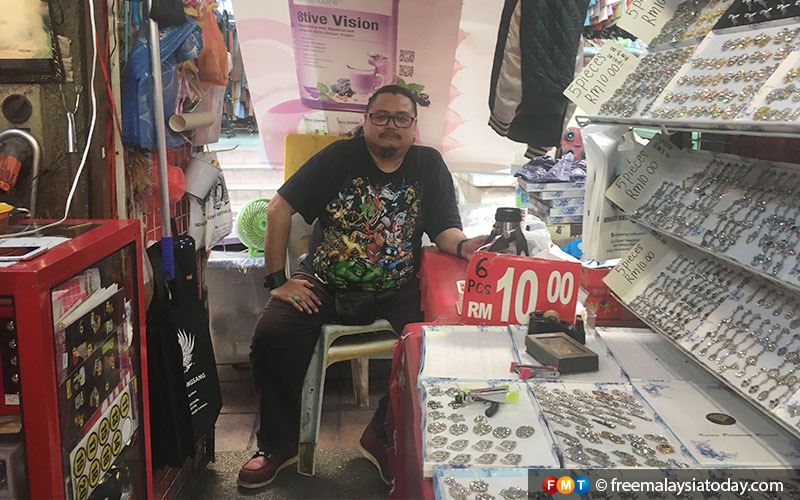 Mohd Nasahrudin Abass, 43 questioned if DBKL had really done their research, saying that most hawkers who were moved into buildings end up struggling. He said he lives from month to month, making just enough to pay the bills and loans, but with little to spare for savings or leisure. The changes feared by the vendors arise from plans by the Federal Territories Ministry to close a section of Jalan Tuanku Abdul Rahman for private vehicles. Stalls at some of the surrounding alleys will be cleared. A one-month trial will begin on April 1, with the road closed to traffic from 8am to 12pm, from Jalan Esfahan near Sogo to Jalan Melayu, on weekends and public holidays. FT minister Khalid Samad said licensed hawkers would be relocated after new kiosks were built. Part of Jalan Tuanku Abdul Rahman would be turned into a pedestrian walkway.